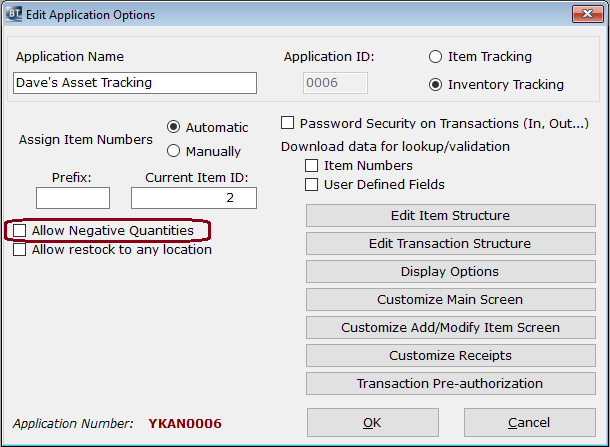 This article explains the BACKTRACK error message “The resultant quantity will exceed the maximum length that has been setup for the quantity field.” and details how to fix the underlying problem that caused it to appear. This message appeared when attempting a “Take Out” from an application where “Allow Negative Quantities” is unchecked. It is likely that item had a quantity of zero so an attempt to take out something with a quantity of zero is impossible unless the database is allowed to record negative numbers. There are occasions where allowing negative numbers makes sense. Once such occasion is when actual inventory runs to zero and a user who does not have security to do a Restock needs to immediately access the item when the stock arrives. In that case, it may be advisable to let the user do a Take Out before the item is actually Restocked into inventory so at least the system can track the Take Out transaction. Later, when an authorized user does the Restock, it will bring the inventory quantity back to a positive number (or zero). This message is not so much an indication of an error of fault in the program but more of a warning to user about the consequence of doing a Take Out that reduces the inventory to below zero when the BACKTRACK application is set to now allow negative quantities. Checking the “Allow Negative Quantities” fixed the problem in the situation above. Tagged: BACKTRACKBACKTRACK Error MessageErrormaximum lengthMessageThe resultant quantity will exceed the maximum length that has been setup for the quantity field.